Ireland Golf Course Carne, a northwestern gem. Irish golf course Carne is a world-class challenge in rural northwest County Mayo. In golf parlance, northwest Ireland’s courses are often referred to as “hidden gems." I’ve played close to 100 rounds of golf on the Emerald Isle, and a particular favorite of mine is the Carne Golf Links, located in a small, out-of-the-way town called Belmullet. The course sits on a tip of land in northwest County Mayo, at the edge of the Atlantic. It’s the sort of place where you’ll hear the sound of mooing cows in the distance and smell the peat as you pull into the parking lot. Like other great courses in this part of the country (Rosses Point, Ballyliffen, Enniscrone, Connemarra, Donegal), Carne is an unbelievably challenging and beautiful links course that’s still virtually unknown to anyone but the Irish themselves. Ireland golf course Carne has an unusual history. Completed in 1993, it is the work of the great Irish golf course designer Eddie Hackett. The land for it was bought from farmers in the 1980’s. Hackett was so taken by the natural beauty of this land that he announced: “It took nature thousands of years to create this land, we must not let the bulldozer destroy it." Consequently, the course was built by 27 local farmers, for the most part with hand spades and rakes. They started in 1987 and finished in 1993. As on most great links courses, you’re playing against the elements – the wind in particular – at Carne. With the Atlantic close at hand and barely a single tree on the place, it’s not unusual to be hitting into 25 – 30 mph winds. The course, as they say, “rewards the straight ball." Stated differently – If you hit your ball off the fairway, you’ll end up in rough that’s unlike anything you’ve ever seen at home in the U.S. The bunkers have such steep faces that the only way to play out is often backwards or sideways. Greens, endlessly raked by the wind, are hard and fast. If you can handle playing in this kind of environment, or just not worry too much about your score, the wild beauty of the place will overwhelm you. The design of the holes seems enhanced by the natural look and feel of the course. There’s less concern here with having fairways appear as a perfect blanket of green than in the US. As a result, far fewer chemicals are used on the course. And, of course, you won’t find many sprinkler systems, since Ireland is a kind of giant, natural sprinkler system. What I enjoy even more than the golf is the pleasure of being in a rural area like Belmullet. It takes a flexible attitude to enjoy northwestern courses. Most of them are near very small villages that don’t have lots of amenities like luxury hotels. You also need to be prepared for 12- or 13-year-old local caddies, who probably won’t be able to tell you where your ball went, help you read greens or club you on every shot. The payoff is that you may arrive in the morning at world-class ireland golf course Carne, and find you’re the only one there. When you do encounter other players, they’ll probably be locals. You won’t run into anywhere near the number of Americans that you’ll find on the more famous courses to the south. And last but not least, tee times are easy to get here and greens fees are only about one-third what you’ll pay elsewhere. You can expect an average 165 Euro fee for the best known course. At Carne and it’s sister courses in the northwest, you’ll pay only 60 Euro (the low fee is one of the reasons you’ll meet local people out on the course. People who live near better-known courses can’t afford to get on them!). 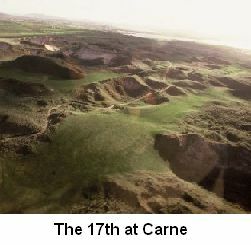 Carne can certainly be considered one of the finest links courses in the world. For more information, visit Carne's website or call 011 353 353 97 82292. Dan Hartnett owns Shamrock Golf Tours, an operator of custom golf vacations specializing in Ireland.